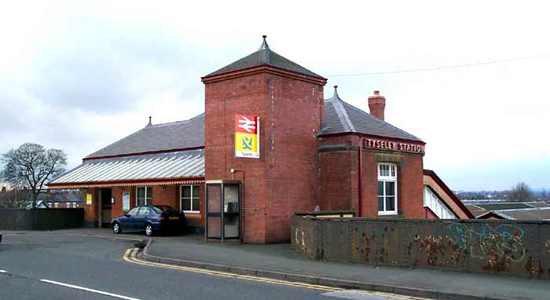 Tyseley station opened in 1906 on the GWR's line from Moor Street to Leamington Spa and beyond to Paddington. However, in 1908 the GWR opened the North Warwickshire Line which had originally been planned by the then-fledgling and soon to fail independant Birmingham and North Warwickshire Railway Company in 1894. 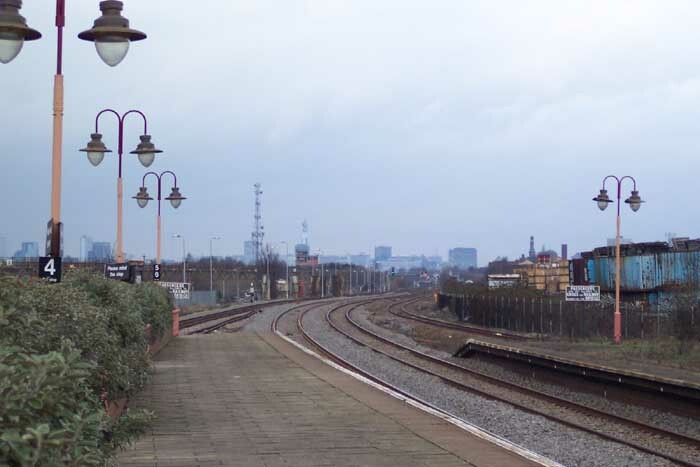 The North Warwickshire Line was joined with Moor Street-Leamington line at Tyseley thus making Tyseley station itself a busy and important GWR concern. In addition to this, and possibly reflecting its new-found importance, significant goods facilities and the 'legendary' Tyseley Shed were built here too. 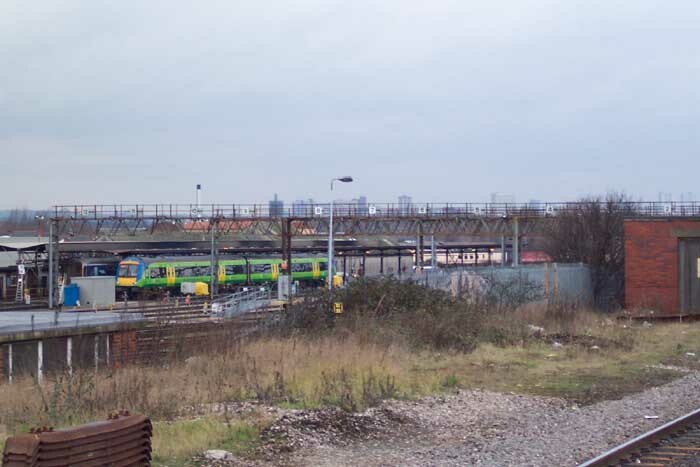 Above, we see Tyseley station building perched on the Wharfdale Road overbridge above the trackbed. Above-left we are on the Wharfdale Road overbridge with the station building to our left. The goods sidings to the right and the platform to our left are now disused. 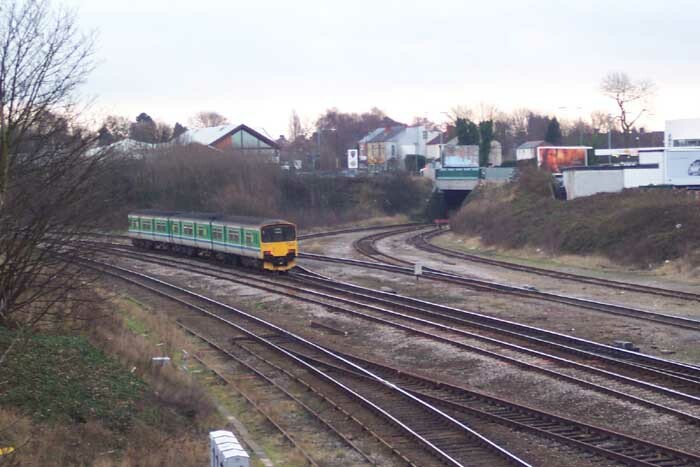 Above-right we are looking towards Leamington from the Wharfdale Road overbridge and can see the North Warwickshire Line branching off to the right with the DMU heading to Leamington on the original line through Tyseley. 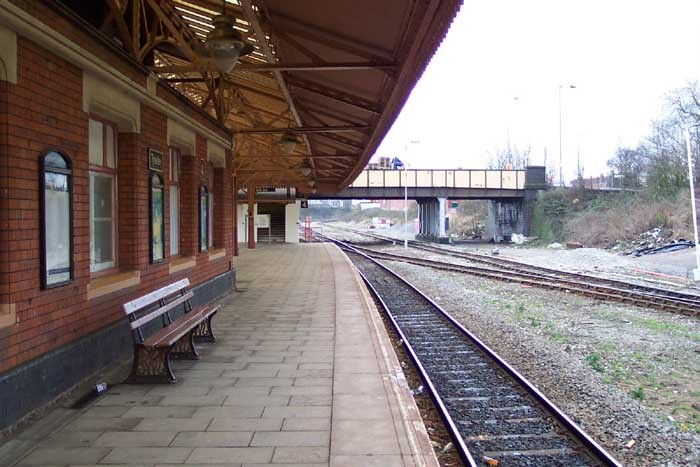 Above-left we have moved down to platform level and are looking at the station building and Wharfdale Road bridge from platform 3 in the direction of Leamington. 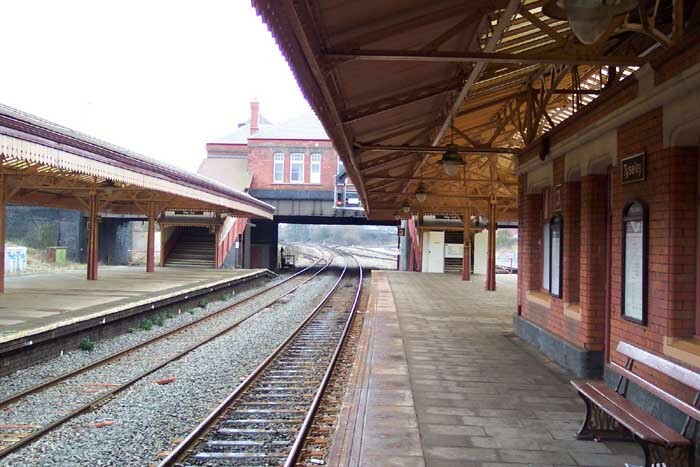 Two things strike you at this station: firstly, it is remarkably clea - almost appears to be unused and secondly, it has retained its trademark GWR features and by and large they are in pristine condition - note the cannopy edging. Above-right we have moved to our right from the previous image and platform 3 has become platform 4 and we are again looking towards Leamington. Note the original bench in the foreground with its wrought iron 'GWR' logo moulded into its stand. Above-left we are back on platform 3 but this time looking towards Birmingham - platforms 1 and 2 on the right are, although immaculatley maintained, disused. 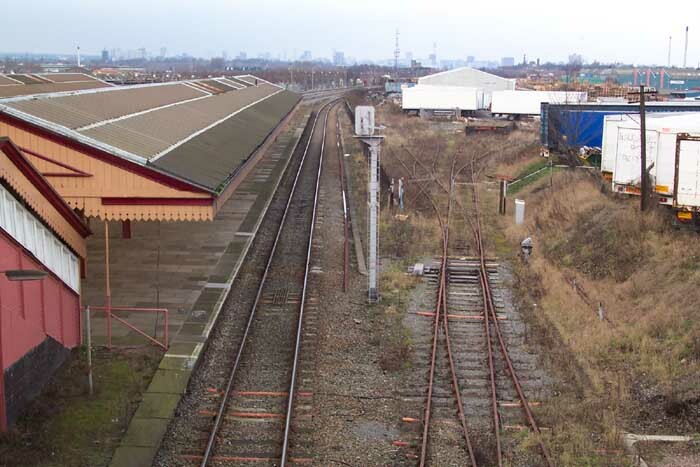 The equally disused goods sidings (now somewhat truncated) can be seen beyond that platform plus the remains of some brick 'piers' previously used for locading/unloading can be seen in the image above-right. 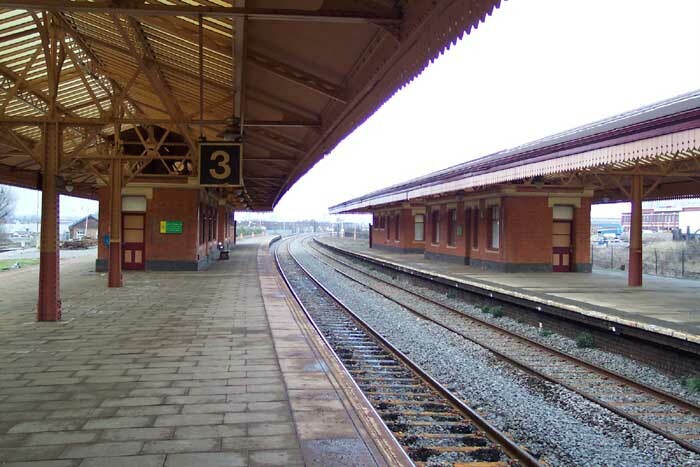 Above-left we are at the end of platform 3 watching the lines burve away towards Birmingham (Moor Street). 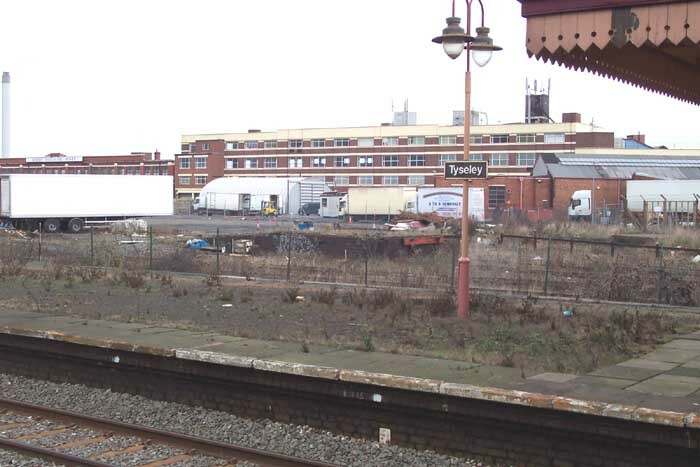 Above-right we can see evidence that Tyseley still serves a rail support function. The lines branch away from the station alongside platform 4 and lead to what we can see in this photograph, modern-day shed with cleaning and basic maintenance facilities. In addition to this, and possibly something to do with the rather pristine nature of the station, is the Birmingham Railway Museum which is also rail linked here. Although a shadow of its former self in terms of sheds and goods facilities, Tyseley is still a large concern and well-worth a visit: I could not do it justice in a handful of photos - it is definitely worth spending an hour or two walking around the perimiter of the site on Warwick Road and Wharfdale Road and exploring the platform buildings.